A portfolio is a special type of reporting site that operates like a dynamic Project Office. Any site you add to the Portfolios list in a portfolio will be reported on as if the site were under the portfolio site. This enables you to create collections of project sites for your own reporting purposes. The Portfolio Reporting area is where portfolios are created and managed. To understand the significance of this, look at the image below. 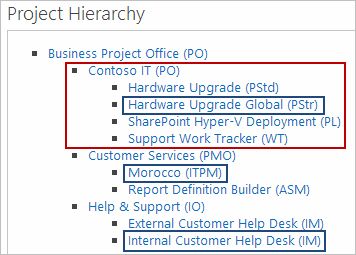 The highlighted Project Office automatically reports on the sites in the red box. A portfolio would allow you to report on just the sites in the blue boxes (or any mix of sites that made sense to you). Note: Do not add or remove columns to or from the Project Portfolios list.